This image was taken at our house on Nellis Park in Rochester NY around 1950. 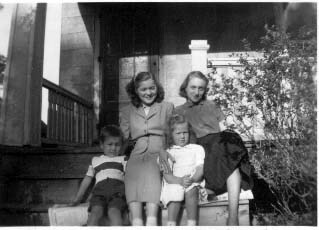 Mom is on the upper right, with her daughter Gail next to her. The little boy on the lower step is her son Andy, the little girl is the neighbor girl Lois who was Andy's first "girl friend"!